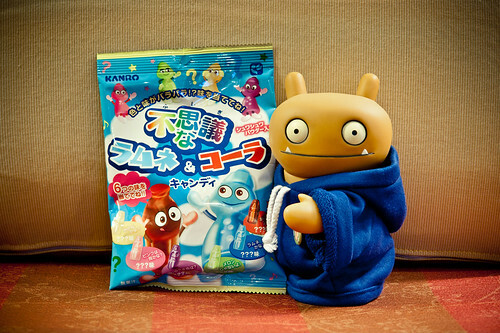 Uglyworld #1600 - Sweeties Surpriser (Project TW - Image 188-366), a photo by www.bazpics.com on Flickr. I callereds home to speakers to Tray todays and whiles I was tellerings her all abouts the sights and sounds of Hsinchu cities, she askereds me if I had trieds any locallers goodies yet? I realisereds that I has already eatereds dumplingers and some mega tastiers Taiwanesers pancakers, buts so far I hadn't triereds some candies from Taiwans! My missions for this evenings was to finders some kinds of sweeties which lookereds so goods that I just hads to buyers them, and here's you have what I is callerings my "sweeties surpriser" as I has no ideas what they is going to tasters like, oh wells, here goes nothings!